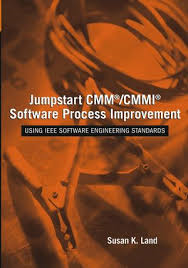 “Jumpstart CMM/CMMI Software Process Improvement: Using IEEE Software Engineering Standards”, Susan K. Land; John-Wiley & Sons, 2005. This text provides an overview of the CMM and CMMI models as well as an overview of all of the IEEE Software and Systems engineering standards and mapping between the software process improvement model and the IEEE standards set. “Practical Support for CMMI-SW Software Project Documentation: Using IEEE Software Engineering Standards”, Susan K. Land, John Walz; John-Wiley & Sons, 2006. This text provides a detailed standards-based guidance on how to implement the CMMI-SW. Information is included on how to define and train the process team, set goals, fix timelines, baseline and implement processes, and perform the gap analysis and self-audit. Common procedural pitfalls and avoidance measures are also described. The text includes an integrated set of over twenty deployable document templates and examples of over fifty common work products in support of CMMI assessment activities. These artifacts are explained in detail within the text, but are included in a CD-ROM so that individuals can actually apply what they have learned. 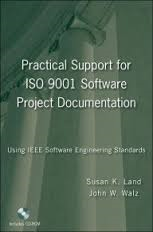 “Practical Support for ISO 9001 Software Project Documentation: Using IEEE Software Engineering Standards”, Susan K. Land, John Walz; John-Wiley & Sons, 2006. This text provides a summary of the ISO 9001 model and provides detailed guidance on the implementation of the ISO standard. The text details 12207 primary, supporting, and organizational lifecycle modelling of ISO 9001 and also describes how ISO 9001 might be used to support small projects. The text describes 35 deployable and integrated document templates. These templates teach the principles of software engineering because they are based upon the IEEE Computer Society software and systems engineering standards. They are integrated to support the ISO 9001 quality activities and to show organization how to apply IEEE software engineering standards to facilitate the development of sound software engineering practices in pursuit of ISO 9001 quality activities. “Practical Support for Lean Six Sigma Software Process Documentation: Using IEEE Software Engineering Standards”, Susan K. Land, John Walz, Doug Smith; John-Wiley & Sons, 2008. This book provides a set of IEEE Software Engineering Standards-based templates that support the process definition and work product documentation required for all activities associated with software development projects. Provides practical support for individuals responsible for the development and documentation of software processes and procedures. The objective is to present the reader with an integrated set of documents that support the initial requirements of a Lean Six Sigma program. Author, Appendix M: Introduction to IEEE/EIA Standard 12207; Guidebook for Acquisition of Naval Software Intensive Systems; Office of the Assistant Secretary of the Navy, Research, Development and Acquisition; V 1.0; April 2008. Land, S.K., Hobart, W.C., Walz, J.W., A Practical Metrics and Measurements Guide For Today’s Software Project Manager; IEEE Computer Society ReadyNotes Guidebooks; June 11, 2008; Winner of MITRE Corp Ronald Fante Best Paper Award 2009. Land, S.K., Gotski, Systems Enterprise Engineering in the Reluctant Organization; IEEE Computer Society ReadyNotes Guidebooks; EPD November 2010; Winner of MITRE Corp Ronald Fante Best Paper Award 2011. Land S.K. ; Walz, J.W. ; IEEE Software Engineering Standards Support For ISO 9001: Getting Your Organization Started; IEEE Computer Society ReadyNotes Guidebooks; Dec. 2006. Land, S. K; IEEE Software Engineering Standards Support for the CMMI Project Planning Process Area; IEEE Computer Society Ready Notes Guidebooks; Feb 2006. Land, S.K. ; Cyber Security Considerations for Today’s Industrial Control Systems. 44th Annual Conference of the IEEE Industrial Electronics Society; Keynote Address. Oct 21, 2018. Land, S.K. ; Building Effective, Cross-Functional Integrated Product Teams. CM Crossroads, November 2015. Land, S.K. ; When Computer Programming was ‘Women’s Work’; IEEE Women in Leadership, February 2014. Land, S.K. ; Computer Girls, Dinner Planning and My Miracle Machines; IEEE Potentials June 2014. Land, S.K. ; Why Software Engineering Certification Makes Sense in Today’s Environment; ITPro, June 2012. USA. Land, S.K. ; Implementing Organizational Strategies: Progress Made in 2009; Computer; December, 2009. USA.